Chicken and rice casserole reminds me of my grandma’s house and it’s one of my favorite comfort meals. It’s pretty easy to make but it takes FOREVER in the oven. Okay, maybe that’s a slight exaggeration, but I am not very patient with casseroles that take over an hour. I always forget to put them in the oven in time for dinner. That is why I love this Instant Pot chicken and rice. It is so simple and turns out perfectly every time and it takes less than half the time to cook compared to the oven casserole. My very favorite part of using the Instant Pot for this recipe is that it is a one pot meal, so there are no extra dishes to wash. (Add lots of heart eye emojis!!!) I have made this recipe quiet a few times and my family raves every time. I use brown rice in my recipe because I prefer it over white rice. I have never tried this recipe with white rice so I don’t know how it would turn out, but I imagine it would be the same. You can use this homemade cream of chicken soup in this recipe. It’s healthier and it tastes better and is seriously so easy! It’s only 3 ingredients and spices and takes about 5 minutes to make, but a can of condensed cream soup works great too! I like chicken thighs because they cook fast and shred nicely after cooking. You can use boneless, skinless chicken breast, if you prefer. 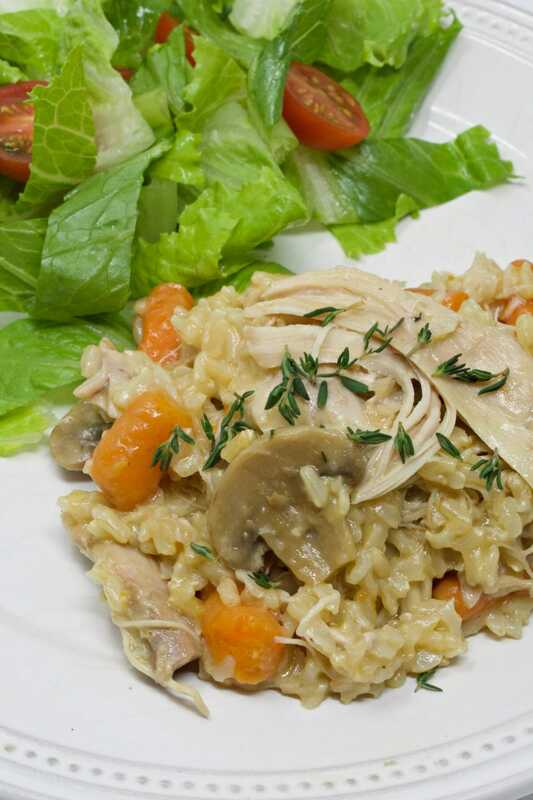 Quick and super easy chicken and rice casserole made in the Instant Pot. Turn Instant Pot on to SAUTE mode. When Instant Pot says "Hot" heat olive oil and sauté onions until translucent. Then press CANCEL button to end saute mode. Add broth to the pot and deglaze the bottom of the pan by gently scraping the flavorful brown bits off the bottom of the pan. There is no need to discard the brown bits. Rinse brown rice and add it to the pot. Stir in carrots and mushrooms. Arrange chicken breasts on top of veggies and rice; season with salt and pepper. Add cream of chicken soup to the top of the chicken and add sprigs of thyme. *Do not stir in the cream of chicken! Secure lid on Instant Pot, and turn nozzle to SEALING. Cook on MANUAL high pressure setting for 25 minutes. Once the cooking is done, turn the valve from sealing to venting. Be careful not burn your hand on the hot steam! Once steam has released, open Instant Pot lid and stir to shred the chicken and combine with rice and veggies.